All of this took place last Friday (21st Jan). A high pressure system is currentlly lodged over us here in the UK leading to fairly settled conditions. There has been very little rain or wind for a while now but we do seem to be oscillating from bright, sunny and crisp days to cloudy, dank grey ones. On the clear crisp days the place looks stunning. 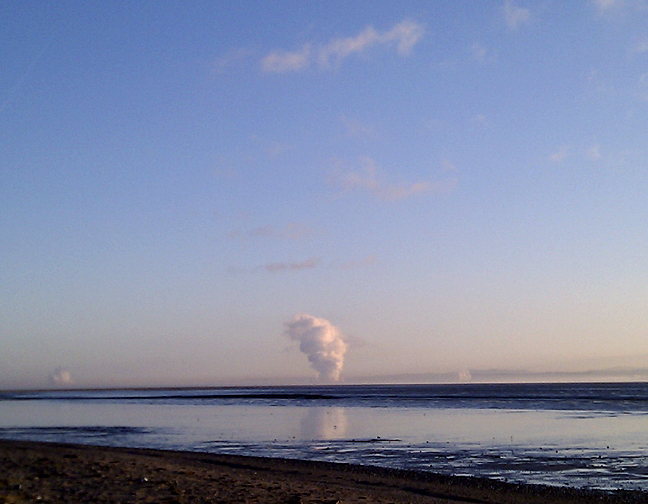 The intense blue is only interrupted by the plumes from the power station on the Welsh side. The steam from the cooling towers quickly condensing in the cold air. It looks like the woolly stuffing is being pulled from the Clwydian Hills. Big tides were predicted for all of this weekend but with the high pressure and little wind I don't think we'll see the full estimates of high water achieved. So what does this mean for the birding plans? A birdwatch on a rising tide can be fantastic, but get it wrong and you'll have a frustrating day. Tactics can make a big difference to the success of trips out and I think a few tactics will be needed for the weekend. The first big tide can push a lot of the birds far down the estuary where they can stay making the subsequent days disappointingly quiet, so a Friday trip should be best. Next is the venue. 9.8 metres is the predicted height but I think that's optimistic, so not too far down the estuary as the tide wont get that far. Banks Road in Lower Heswall fits the bill and is chosen. Also, I fancy if the tide does get big there is a decent chance of both Common and Jack Snipe in a great strip of marsh close in and if it floods they'll come out. I could do with both species for the list too! So it's down to Heswall Shore about 3 hours before high tide. A short but muddy walk goes past the sewage works (a little whiffy today) which is checked for overwintering Chiffchaff - no sign, to the armour stone at the end of Target Road. Up on to the flat top of this gives a great view of the fringe of the marsh and the mudflats. A sweep with the scope to see what's coming our way. Lots! Big flocks of waders are moving and huge rafts of duck are starting to form up as the tide starts to flood the flats at Thurstaston. This bodes well. Another estuary watcher lets on that both our Snipes were about 24 hours previous, this bodes well too! In the rag tag fringe of the spartina there are 70-odd Golden Plover mixed with loads of Lapwing. Something sets them off on a high circuit of Heswall before settling again. Channel is filling quite quickly and I get that feeling that we are in for a real treat today. The tactics are spot on and the birds are going to give us a great show. AWESOME! Redshank are here in abundance but no sign of Spotteds or Albi. Albi is something of a local celebrity. He's a leukistic bird in his 13th winter at the Heswall Shore roost. He was spotted at high water yesterday but doesn't put in an appearance today. Dunlin numbers are very high too. They look like ants on the flats with the naked eye, but morph into birds through the telescope. At least 3,000 are here. There could easily be a Curlew Sand here but they are too quick for us to pick one out. More than 350 Black-tailed Godwits come out of the channel and line up in front of us. 2 ringed birds in that number, both regulars this winter. The water is really up now and the birds are all urgently feeding before the enforced roost of high water. Curlews never seem to abundant on the flats. I suppose you don't see them in the tight flocks like some other species but rather feeding in ones and twos. The tide has distilled them into a single big group in the centre of the marsh. They go up in unison and this heralds the entrance of a Peregrine. It zooms off in the direction or Riverbank Road. Things don't settle down though because the water is flooding the marsh now and the birds have to move. As the waders mill around on whats left of the mud the Pintail and Shelduck continue their serene progress around the back of the marsh. About 3,000 Shelduck and 1,000 Pintail drift past us. Stunning. The grass in front of us is wetting up. This means one thing... Snipe-time! We are not disappointed! A small bird comes up, silent then flies a few metres and drops into the golden grass at the edge of the beach. 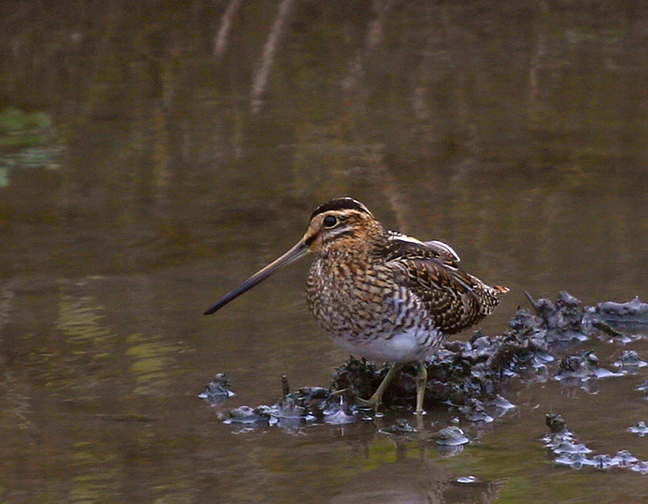 We get a great view of it even though it is brief and soundless but we can positivly ID it as a Jack Snipe. Soon after we get an equally great view of Common Snipe. 2 more species for the patch list! I love this site, you get great spectacles like the massed flocks of waders in the air, the marauding raptors and the flotillas of ducks. But you also get a chance to see these birds in close up next to each other (like the Snipes). So it's like a lesson in shorebird ID and an arty wildlife documentary at the same time. The water is right up now and it has forced the birds right past us and into the marsh and out of sight. The action came thick and fast and now it's over breath can be caught, note taken and blog posts planned!